Jeans button, Swarovski® crystals and silver-finished brass, Crystal Passions®, crystal AB, foil back, 17mm round (1791/120). Sold per 2-piece set. 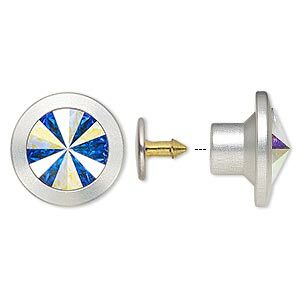 Swarovski crystal buttons for jeans can be used exactly the same way as standard buttons while adding signature Swarovski sparkle to jeans or jewelry-making. These incredibly versatile, easy-to-use foil back components consist of a silver-finished brass button casing with set crystal and button back with nail point. No sewing required, the buttons are securely set to fabric using the Crystal Applicator tool and button die attachment set.